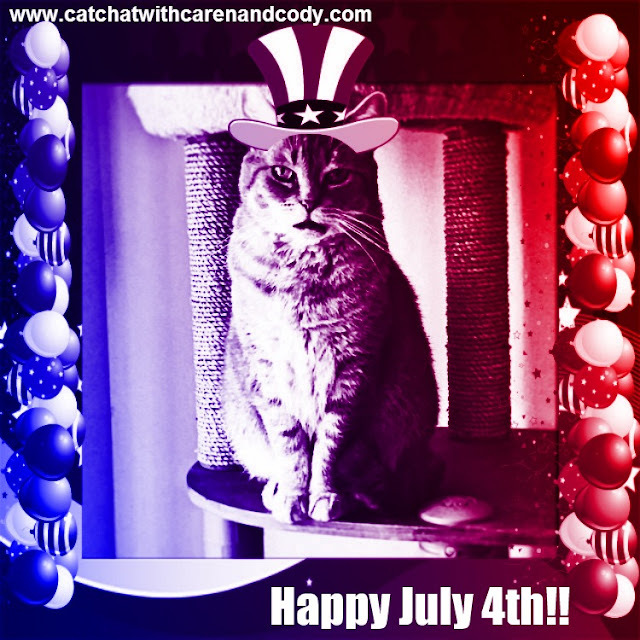 Cat Chat With Caren And Cody: Have a Happy and Safe 4th Of July!! CLICK HERE TO SEE THE REST OF THE POSTS!! ALSO, THERE IS A JULY 4TH CELEBRATION GOING ON IN THE TABBY CAT CLUB! HEAD ON OVER BUT WATCH OUT FOR THOSE FIRECRACKER BOOMIES!!! Have a great holiday and you look good there as an Uncle Sam (wannabe), MOL! A happy 4th of July to you, we hope YOU have a safe holiday. P.S. "Nuisance noise" is a good way to put it, but let me tell you, when you listen to the a&&wipes next door, it takes "nuisance" to a whole new level. LOL. Happy 4th of July to you and your mom - have a safe holiday! Thank you Ingrid!! Happy Happy 4th to all of you!!! Be safe!! We send our love! Awww thank you!! You have a happy 4th too!!! Happy 4th of July, Cody. glad you joined Caturday Art!! Happy Fourth Cody to you and all of your family. Hope you have a great day and a safe day.. Take care. Cody, you look so patriotic! Have a fun and safe 4th! Cody, you are a winner always. Happy 4th! Awwww thank you!!!!! Happy 4th to you! Happy Independence Day, Cody and Caren! Stay safe, and let freedom ring! Happy 4TH Cody and Caren! Great art and a Happy 4th to you ll! thank you!! Happy 4th to you too! Yous look so handsum Cody. Have a gweat day and stay safe. Happy Independence Day to all of you...hope you are having a great holiday weekend! I love that graphic! Happy 4th! Happy 4th of July! It was pretty quiet all day...but starting to get noisy now. Cody! WOWZER! Yous looks Hot! Happy Independence Day to all of yous from all of us! I hope you had a great day yesterday! We'd also like to participate in Caturday, but Mom hates photo editing. Bah. Thank you! We did but our dog didn't! MOL! The boomies were going off from 9pm til midnight! Hope you all had a great Fourth! We were celebrating big time. Well, as big as cats can!